There are very few pieces of software where a casual approach can be taken to the process of software development. Software development is intrinsically a difficult process, gathering requirements, design, development and testing all taking large effort. In reaction enterprises have setup and adopted strict development processes to build software (or at least the successful enterprises have ;-). ADF and JDeveloper are sold as productivity boosters for developers. Yet in the end they are just a technology platform. By themselves they don't solve the complexities of software development process as a whole (though they do make parts of it easier). This leaves IT departments struggling, as they might like the potential of ADF as a platform, but they intrinsically know there's more to software development, there's the process of development to consider. How will the tasks of requirement gathering, design, development & testing be applied to ADF? And more importantly how to shortcut the process of establishing these for ADF within the enterprise? There's a need to bring the two concepts together, the technology & the process, to help the adoption of ADF in the enterprise. As ADF matures we're slowly seeing more books on Oracle's strategic JSF based web framework. Up to now the books have focused on the holistic understanding of the technical framework, the tricky & expert level implementation, or more recently the speed of development. Sten Vesterli's Oracle ADF Enterprise Application Development - Made Simple is the first to apply the processes and methodologies of design and development to ADF. Of particular delight Sten's book starts out by suggesting building a proof of concept to skill up teams in ADF, to learn the complexities, & gather empirical evidence of the effort required. From here a focus on estimation and considerations of team structure are raised, all valuable stuff for the enterprise trying to control the tricky process of software development. In order to make use of reuse, the next few chapters focus on the infrastructure and ADF constructs that need to be setup before a real project commences, including page templates, ADF BC framework classes and more. This is the stuff you wish you'd been told to create first if you forged ahead in building with ADF without any guidance. Then chapter by chapter the tasks of building, adding security, internalization and other development efforts are covered. There's even a chapter on using JMeter to stress test your ADF app (with a link back to my blog! Thanks Sten). As can be seen from the topics, there's relatively little consideration of actually implementing ADF Business Components or ADF Faces RC. As such it must be said reading this book won't make you an expert in the technical side of ADF, but rather will address how you can take a sensible approach to the overall development process. All in all Sten Vesterli's Oracle ADF Enterprise Application Development - Made Simple is another valuable book in my ADF bookshelf and a recommended read for enterprise specialists looking at adopting ADF into their organisation. Disclaimer: I know Sten personally and in addition Packt Publishing has provided me Sten's book for free to review. test_srv is a service which has both the instance running on node1 and node2 as preferred instances. On node1 the service was manually stopped. The service is now running on both instances, although before the crash the service was set offline on node1. This time both services stay offline. Now the service has started again on the restarted instance. Explanation for this is that the service was configured to come up automatically with the instance, which explains why the service is started on the restarted node. For the failover this seems to me as expected behaviour as it is the same as what would happen with a preferred / available configuration. As I have other services which have a preferred / available configuration, I know this service should failover. Service test_srv is not running. I could find no clues in the different cluster log files as of why the relocation did not occur. More testing will be necessary. Also note that the output of the crsctl status resource does not contain information about on which node or instance the service is expected to be online. A second run of this test gave the same result. PRKH-1014 : Current user grid is not the same as oracle owner orauser of oracle home /opt/oracle/orauser/product/11.2.0.2/dbhome_1. Nope, the user modifying the service has nothing to do with it. I also tested the scenario where I directly created a preferred / available service, but in this case the failover also did not work. But after some more testing I found the reason. During the first test I had shutdown the instance via sqlplus, not via srvctl. And the other services I talked about had failed over during this test (I never did a failback). After doing the shutdown abort again via sqlplus, the failover worked again. as expected, starting the instance again did not trigger a failback of the service. Question now is, if the failover not happening when issuing the shutdown via srvctl is expected behaviour or not. For this, one probably would have to open a service case, answer a couple of question not important for this issue, escalate and still have to wait for several months. Do I sound bitter now? When restarting an instance, an offline service that has this instance listed as a preferred node will be started (management policy = automatic). When an instance on which a service was running fails, the service is started on at least one other preferred instance. The service will remain running on this instance, even when the original instance is started again (in which case the service will run on both instances). When a service has a preferred / available configuration, the service will failover to the available instance, but not failback afterwards. What if there where more then 2 nodes, with a service that has all three or more nodes listed as preferred, but currently only running on one node. If the instance on which that service is running fails, would the service then be started on all preferred nodes or on only 1 of them? What if, in the above case, the service was running on 2 nodes. Would it still be started on other nodes? And what if one of the nodes was configured as available and not as preferred? Would the service on the preferred node still be started or the one on the available instance or both? And last but not least, is the srcvtl shutdown behaviour a bug or not? Amar Lettat, one of my colleagues at Uptime, has pointed me to MOS note 1324574.1 – “11gR2 RAC Service Not Failing Over To Other Node When Instance Is Shut Down”. This note clearly points out that the service not failing over when shutting down with srvctl is expected behaviour in 11.2. It also points to the Oracle documentation, where this behaviour is also documented. So not a bug, only a well documented change in behaviour. I just released Oracle enhanced adapter version 1.4.0 and here is the summary of main changes. Oracle enhanced adapter GitHub version was working with Rails 3.1 betas and release candidate versions already but it was not explicitly stated anywhere that you should use git version with Rails 3.1. Therefore I am releasing new version 1.4.0 which is passing all tests with latest Rails 3.1 release candidate. As I wrote before main changes in ActiveRecord 3.1 are that it using prepared statement cache and using bind variables in many statements (currently in select by primary key, insert and delete statements) which result in better performance and better database resources usage. On JRuby I switched from using old ojdbc14.jar JDBC driver to latest ojdbc6.jar (on Java 6) or ojdbc5.jar (on Java 5). And JDBC driver can be located in Rails application ./lib directory as well. RAW data type is now supported (which is quite often used in legacy databases instead of nowadays recommended CLOB and BLOB types). rake db:create and rake db:drop can be used to create development or test database schemas. Support for virtual columns in improved (only working on Oracle 11g database). Default table, index, CLOB and BLOB tablespaces can be specified (if your DBA is insisting on putting everything in separate tablespaces :)). Several improvements for context index additional options and definition dump. If you want to have a new feature in Oracle enhanced adapter then the best way is to implement it by yourself and write some tests for that feature and send me pull request. In this release I have included commits from five new contributors and two existing contributors - so it is not so hard to start contributing to open source! One of the worst parts of Oracle enhanced adapter so far was that for new users it was quite hard to understand how to start to use it and what are all additional features that Oracle enhanced adapter provides. There were many blog posts in this blog, there were wiki pages, there were posts in discussion forums. But all this information was in different places and some posts were already outdated and therefore for new users it was hard to understand how to start. After reading about Readme Driven Development and watching presentation about Readme Driven Development I knew that README of Oracle enhanced adapter was quite bad and should be improved (in my other projects I am already trying to be better but this was my first one :)). Therefore I have written new README of Oracle enhanced adapter which includes main installation, configuration, usage and troubleshooting tasks which previously was scattered across different other posts. If you find that some important information is missing or outdated then please submit patches to README as well so that it stays up to date and with relevant information. If you have any questions please use discussion group or report issues at GitHub or post comments here. Oracle OpenWorld 2011 Content Management team announced today that the conference Schedule Builder is now online. Registered attendees can log in to search through hundreds of sessions, partner exhibits, and Oracle demos and find content of interest to enroll in sessions and build your conference agenda. A recommendation engine powered by Oracle Data Mining provides a list of sessions, demos and exhibits that are most relevant to you. Once a session is added to the personal agenda, any session change information or communication is automatically sent. It also provides the conference organizers an idea about the popularity of a session. In case the designated room is overbooked on the schedule builder, then the session is often moved to a location with more seating capacity. It is always a good idea to use the Schedule Builder to enroll in sessions and get early access. In order to gain early access attendees must be enrolled in the session and arrive at least ten minutes before the session start time. Enrolled attendees are seated first and then non-enrolled attendees are seated for the most popular sessions. Those who are yet to register, please view the Content Catalog to see list of session topics, demos and exhibits. Please add Session # 8042 on your agenda for a session on Oracle Certification at Moscone Center West Room 3000 from 5.00pm - 6.00pm. One lucky attendee will win an Oracle Certification Exam exam voucher as the audience prize! Amazon has been steadily moving toward making their web service offering ready for the enterprise. Over the last year or so they've received certification for Oracle database, they've broken down the barriers that would prevent PCI certification, and they've improved their pricing structure to make it more corporation-friendly. Virtual Private Cloud is now out of Beta and allows you to "provision a private section of the AWS cloud where you can create avirtual network that you control, including selection of an IP address range, creation of subnets, and configuration or route tables and network gateways. you can connect your Amazon VPC directly to the Internet while also extending your corporate data center to the cloud using encrypted VPN connections." But the announcement of Amazon Direct Connect might be my favorite. "Amazon Direct Connect is a new service that enables you to bypass the internet and deliver data to and from AWS via private network connection. With a private connection, you can reduce networking latency and costs, and provide a more consistent network experience while moving data between AWS and your datacenters. With pay-as-you-go pricing and no minimum commitment, you pay only for the network ports used and the data transferred out from AWS over the private connection." There's also new functionality for AWS Identity and Access Management that lets you use your existing corporate identity management system to grant secure and direct access to AWS resources without creating a new AWS identity for those users. I'm excited about the possibilities this opens up in terms of on demand computing capacity in the enterprise. Processes = 25 + 15 * n, where n is the number of instances on the box using ASM for their storage. Refer NOTE 265633.1 "ASM Technical Best Practices" for more information. Problem: Needed to find a way to keep my config and research files under version control which I can get to various machines I work with and update from anywhere. Tried Mercurial, Darcs, Bazaar and Git. Fossil is also a great tool that provides wiki, version control and ticket management. Darcs is the easiest, but for some reason, extremely slow. Finally chose Git. Download and compile was easy. Read top 3 lines in the INSTALL file in source distribution for steps. Rest of the steps explain how I set it up. Note that this may not be the best possible Git workflow. Merely that it works for me. Note that I've installed git in ~/software/git. In fact, in a future release we will likely be changing that implementation detail so that the AMs are always used from their own AM pool, however they will share a transaction/connection.Steve's point from late 2010, and the one that John was re-affirming is that even though the underlying implementation may change, the end effect from the Bounded Task Flow (BTF) programmer's point of view, everything can still work the same. And this is what I needed to check, looking at what AM methods are called is not enough. I needed to check the actual database connections and transaction behaviour. In fact, in a future release we will likely be changing that implementation detail so that the AMs are always used from their own AM pool, however they will share a transaction/connection.Via http://localhost:7101/dms/Spy I've verified this is the case with Bruce, where under 11.1.1.X.0 is used to be a single AM pool, but now under 11.1.2.0.0 there is 2 AM pools & 1 defined connection. The end effect and my primary concern from the previous blog post is now mute, the scalability of database connections is maintained. Bruce is a winner. I haven't had much time to update the blog recently, but just time to post before going on holiday. Over recent weeks there have been numerous stories relating to document theft – the Pentagon commentary on systematic theft of thousands of documents from defense contractors, the reports of journalists hacking into not just phones but the email systems of public and private citizens, the smug announcements by “cyber terrorists” that they’ve stolen files from various organisations. The relevance of IRM is clear. Protect your perimeter, your applications, your file systems and repositories, of course, but protect your sensitive documents too. In the end, there are so many ways to gain digital possession of documents – but only one way to actually make use of them if they are protected by IRM. Anyone stealing a sealed document by whatever means has another substantial line of defense to overcome. And that line of defense is designed to audit and authenticate access attempts as well as consider a number of other risk factors. It can also be rapidly reconfigured to deny access completely in the event of calamity – a single rule change can prevent all access from compromised user accounts or for whole classifications of information. The audit trail can also provide valuable clues as to the source of the attack. In a cloudy world, where perimeters are of diminishing relevance, you need to apply controls to the assets themselves. And the scalable, manageable, intuitive way to achieve that control is Oracle IRM. While building a simple ADF application in JDev 11.1.2 I encountered some strange runtime behavior. I built another application with the same behavior in exactly the same way in JDev 11.1.1.4 and there things worked smoothly. However, in JDev 11.1.2, the addRow and deleteRow functions didn't work as expected. In this post I will share my tough journey in founding out what was happening, and discuss the difference in behavior and the changes required to make it work in JDev 11.1.2. When using the add row button (the green plus icon in the screen shot below) an error message for the required JobId dropdown list was shown immediately. At first I thought this was caused by the partialSubmitproperty on the addRow button, which was set to true. Setting this property to false (or removing this property) fixed this problem, but caused table rendering to hang. Weird, but I didn't investigate that further. I decided to build the same app in JDev 11.1.1.4 which worked smoothly and then opened this app in JDev 11.1.2. After the auto-migration, I ran the app but much to my surprise the "Selection required" message didn't show up. I compared the page and page definition of both apps over and over again, and couldn't see any difference. Eventually, I started comparing all the files in both projects. This lead me to the adf-config.xml file, located in the .adf directory under the root directory of the application, also visible under the Resources panel. In this file, one property existed in the JDev 11.1.2 application that was not present in the JDev 11.1.1.4 version: changeEventPolicy="ppr". By removing this property, things started to work again, and only one request was sent again. Note that the really tricky thing here is that when you upgrade an application from JDev 11.1.1.4 this property does not get added, but new JDev 11.1.2 apps will have this property setting, causing difference in behavior between a migrated app and a new app. At this point, my recommendation is to remove this property (or set it to none) for new JDev 11.1.2 apps. If memory serves me well, in some JDev 11.1.1.x version, dragging and dropping a data a table on a page, added the changeEventPolicy="ppr" property to the iterator binding in the page def. In a later JDev 11.1.1.x release this property was gone again. Looks like it is back in a different form (this time in adf-config.xml), but still with undesirable implications. The next error I hit was in the delete confirmation dialog, when trying to delete a row. Regardless of which button I pressed (Yes or No), I got validation errors on the underlying new row, and the dialog was not closed, nor was the row removed. Now, I think this error has to do with the ADF Faces optimized JSF lifecycle. Since the table needs to be refreshed when the row is removed by clicking yes in the dialog, the af:table component requires a partialTrigger property that refers to the af:dialog element. With this partialTrigger property in place the ADF JSF optimized lifecycle causes the table items to be submitted (and validated) as well when clicking the Yes or No button in the dialog. Now,I am speculating here, but may be this wasn't supposed to work at all in JDev 11.1.1.4, but it did because of a bug in the optimized lifecyle code, that has now been fixed in JDev 11.1.2...? No longer use the dialoglistener property, but instead define custom Yes/No buttons using the toolbar facet on the af:dialog. On these buttons I can set the immediate property to true, bypassing client-side and server-side validation. Do not specify the af:dialog as partial trigger on the af:table component, instead, add the table or a surrounding layout container element as partial target programatically after deleting the row. This is the solution I chose, since it only required one line of code in the managed bean class that deletes the row. 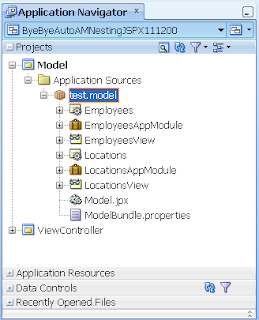 Task Flows: Sayonara automated nesting of Application Modules JDev 11.1.2.0.0? Any readers of this post should also read the following follow-up post. In a previous blog post I discussed the concept of automated nesting of Application Modules (AMs) when using Bounded Task Flows (BTFs) with a combination of the transactional options Always Begin New Transaction, Always Use Existing Transaction and Use Existing Transaction if possible. The automated nesting of AMs is a very important feature as when you have a page made up of disparate regions containing task flows, and those regions have their own AMs, without the auto-nesting feature you end up with the page creating as many connections as there are independent region-AMs. Thus your application is less scalable, and architectural your application must be built in a different manner to avoid this issue in the first place. This automated nesting of AMs is exhibited in the 11.1.1.X.0 series of JDeveloper and the ADF framework including JDev 11.1.1.4.0 & 11.1.1.5.0. Unfortunately, either by error or design this feature is gone in 11.1.2.0.0. Having checked the JDev 11.1.2.0.0 release notes and what's new notes, I can't see any mention of this change. In turn I don't believe (please correct me if I'm wrong) there to be a section in the Fusion Guide that specifically talks about the interactions of the task flow transaction options and Application Module creation. The documentation talks about one or the other, not both in combination. This is somewhat of a frustrating documentation omission to me because it means Oracle can change the behaviour without being held accountable to any documentation stating how it was meant to work in the first place. All I have is a number of separate posts and discussions with Oracle Product Managers describing the behaviour which cannot be considered official. In the rest of this post I'll demonstrate the changing behaviour between versions. It would be appreciated if any readers find errors in both the code, or even factual errors that you follow up with a comment on this blog please. I'm always wary of misleading others, I write my blog to inform and educate, not lead people down the garden path. Why so many versions? My current client site is using 11.1.1.4.0, not 11.1.1.5.0, so I wanted to check there was consistent behaviour in the pre-11.1.2.0.0 releases. For this blog post I'll talk about the 11.1.1.5.0 version, but the exactly same behaviour is demonstrated under 11.1.1.4.0. In addition I know that in the 11.1.2.0.0 release because of the support for JSPX & Facelets, that the controllers have different implementations, so it is necessary to see if the issue is different between the two VDL implementations. Besides the support for 4 different versions of JDev, and in the 11.1.2.0.0 the different VDLs, each application is constructed in exactly the same fashion, using a near identical Model and ViewController setup. The following sections describe what has been setup in both these projects across all the example applications. Each application has exactly the same ADF BC setup connecting to Oracle's standard HR schema. The Model project in each application includes EOs and VOs that map to the employees and locaitons tables in the HR schema. The tables and the data they store are not consequential to this post, we simply need some Entity Objects (EOs) and View Objects (VOs) to expose through our Application Modules (AMs) to describe the AM nesting behaviour. In the diagram above you can see the EOs and VOs. In addition I've defined 2 root level AMs EmployeesAppModule and LocationsAppModule. The EmployeesAppModule exposes the EmployeesView VO and the LocationsAppModule exposes the LocationsView. To be clear, note I've defined these as separate root level AMs. So at the ADF BC level there is no nesting of the AMs defined. What we'll attempt to do is show the automatic nesting of AMs at the task flow level, or not, as the case might be. Each application has a near identical ViewController project with the same combination of task flows, pages & fragments. The only exception being the 11.1.2.0.0 applications, where the Facelets application doesn't use JSPX pages or fragments, but rather Facelets equivalents. This section describes the commonalities across all applications. 1) The start page is designed to call the ParentTaskFlow through a task flow call. 1) The ParentTaskFlow is set to Always Begin New Transaction and Isolated data control scope. 2) The ParentTaskFlow page contains an af:table showing data from the EmployeesView of the EmployeesAppModuleDataControl. Based on my previous blog post on investigating and explaining the automated Application Module nesting feature in the 11.1.1.X.0 JDeveloper series, this is what I believe is occurring. As the ParentTaskFlow is designed to start a new transaction, when the first binding in the page exercises the EmployeesAppModule via the associated Fata Control and View Object embedded in the table, ADF instantiates the AM as the root AM and attaches it to the Data Control Frame. The Data Control Frame exists for chained BTFs who are joining transactions. So in this example the Employees AM is the first AM to join the Data Control Frame and it becomes the root AM. A little oddly we see the EmployeesAppModuleImpl then created again and nested under a root instance of itself. I'm not really sure why this occurs, but it might just be some sort of algorithmic consistency required for the Data Control Frame. Maybe readers might have something to share on this point? It's worth noting the significance of a root AM unlike a nested AM, is only the root AM connects to the database and manages the transactions through commits and rollbacks. Nested AMs delegate these responsibilities back to the root AM. This is why we can see the prepareSession() call for the EmployeesAppModule. "Use Existing Transaction if possible - When called, the bounded task flow either participates in an existing transaction if one exists, or starts a new transaction upon entry of the bounded task flow if one doesn't exist." In order for the BTF to be part of the same transaction, it must use the same database connection too. As such regardless in the ADF Business Components where we defined the two separate Application Modules as root AMs (which by definition implies they have separate transactions & database connections), it's expected the task flow transaction options overrides this and forces the second AM to "nest" AM under the first AM as it wants to "participate in the existing transaction if it exists." So to be clear, this is the exact behaviour we see in the logs of our 11.1.1.X.0 JDeveloper series of applications. The end result is our application takes 1 connection out with the database rather than 2. As such regardless that the Oracle task flow documentation for the latest release says that the second task flow with the Use Existing Transaction if Possible option should join the transaction of the calling BTF, it doesn't. As can see from the logs both AMs are now treated as root and are preparing their own session/connection with the database. The effect of this is our application now uses 2 connections rather than 1, and in turn the BTF transaction options don't appear to be working as prescribed. Is it just a case of philosophy? Maybe this is just a case of philosophy? Prior to JDev 11.1.2.0.0 the ADFc controller (who implements the task flows) was the winner in how the underlying ADF BC Application Modules were created and nested. Maybe in 11.1.2.0.0 Oracle has decided that no, in fact the ADFm model layer should control its own destiny? Who knows – I don't see any documentation in the release notes or what's new notes to tell me this has changed. The task flow transaction option documentation is all I have. As such if you've relied on this feature, your architecture is built on this feature as we have, we're now in a position we can't upgrade our application to 11.1.2.0.0 without major rework. To get clarification from Oracle I'll lodge an SR and will keep the blog up to date on any information discovered. After 30 years of Oracle, I've found myself using MySQL recently. I came across a little thing that surprised me. I'm by no means the first to trip over this - I found this 2006 post from Peter Zaitsey on the same topic. But in the Oracle case we are explicitly selecting the MIN(column_name), whereas MySQL's laxer behaviour is just picking the first column name at random (or rather, dependent on the execution plan). The native functionality basically means you’ll maintain your dimensions in each application separately. So if you want to add a department, you’ll have to add it to PeopleSoft, then Hyperion Financial Management, then Planning separately. Hyperion EPMA provides a robust, single point of administration for EPM applications. It allows you to create a dimension library which allows several EPM dimensions to be centrally stored and re-used across multiple EPM applications. Basic dimension editing capabilities are provided. Individual dimension elements ("nodes" or "members") can be flagged for use within a specific application, supporting slightly different application requirements while promoting dimension re-use. Although this feature has potential, each member must be individually flagged, limiting the usability for large dimensions. EPMA is intended to support only Hyperion EPM applications, and to be utilized by system administrators, not the typical end user. DRM is different in that it was conceived from the start as an agnostic enterprise dimension management platform, and not beholden to Hyperion EPM applications alone. As such, DRM can be deployed to support financial metadata and dimensions in a myriad of systems, ranging from PeopleSoft to GEAC to SAP to Cognos to Teradata to Hyperion and many more. It was also design to support not only system administrator users, but also to allow business users to become direct contributors into the dimension management process.